In this selection of top 5 best surf & yoga retreats, we pick the best resorts in Europe and also include those that are just a short flight from European airports. 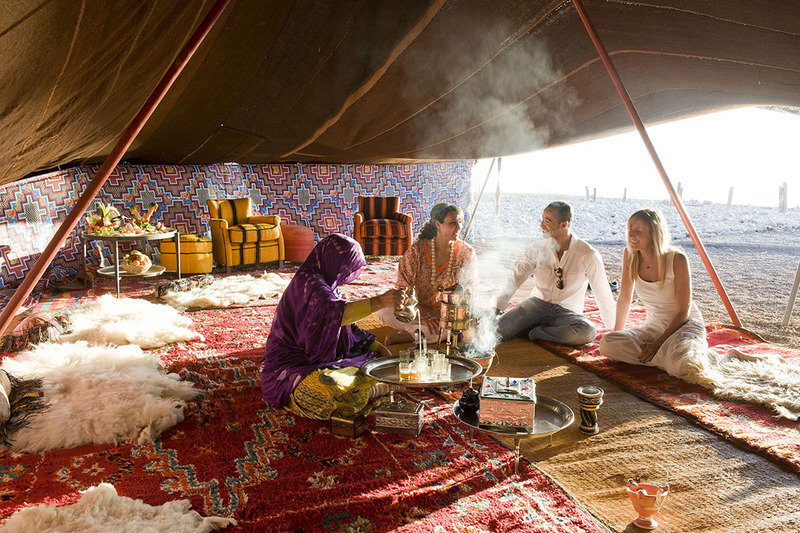 Morocco is, in fact, our first pick because this destination offers excellent surf and yoga resorts which lie right on the beach and enjoy a glorious subtropical climate, cooled by breezes off the Atlantic and Mediterranean. Within Europe, we pick Portugal as our best destination for surfing. It is battered by the Atlantic ocean which means the swell is good, but the southern Mediterranean climate means that it is also ideal for more sedate classes like yoga, which are particularly special at sunrise and sunset. We also include Cornwall in our picks. Yes, the weather can be rainy but when the sun is out, Cornwall offers some of the most beautiful beaches in the world. Paradis Plage Surf Yoga & Spa Resort is our top luxury surf and yoga hotel choice. 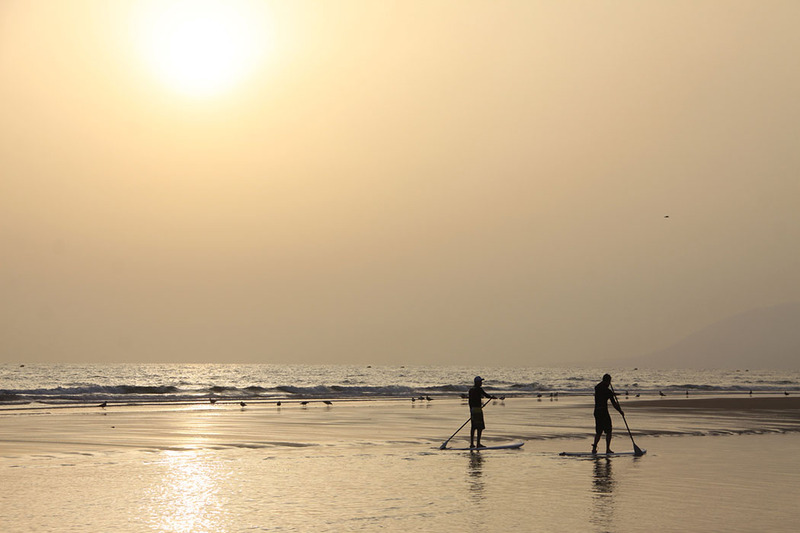 A stay here means that you can surf as the sun rises in a warm sea and yoga in the evening in the warm breeze. Paradis Plage enjoys a superb position on a stunning 5 km long beach. This coastline is perfect for surfing, as the waves boast a constant swell between April and September. Paradis Plage also provides a wide range of yoga classes, including easy yoga for beginners, aerial yoga, yin yoga (to create flexibility in the connective tissue) and power flow which is a more dynamic practice. Don’t miss the evening yoga sessions as the backdrop of sunsets over the beach add a touch of magic. 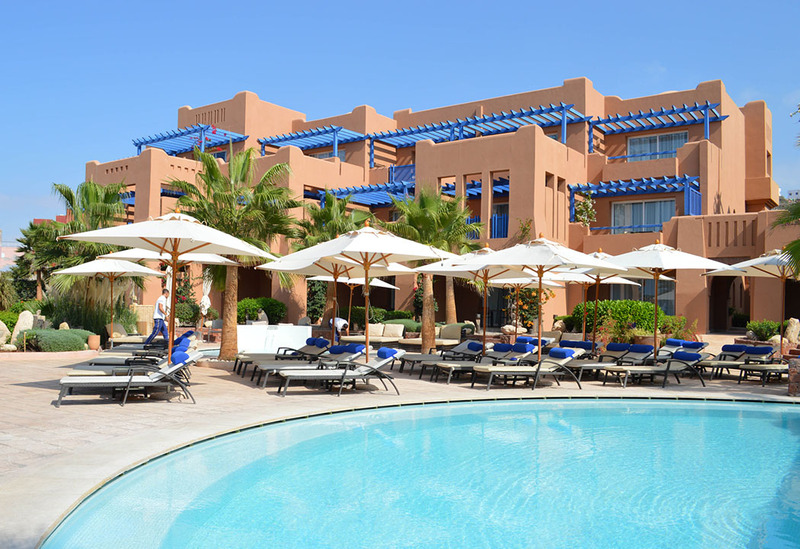 The resort is easy to get to, just 45 minutes from Agadir airport and 5 minutes from Taghazout. Built over two floors, luxurious rooms offer both ocean and mountain views and it’s geographical location in a bay protected by surrounding mountains, means that it has the perfect micro-climate year-round. 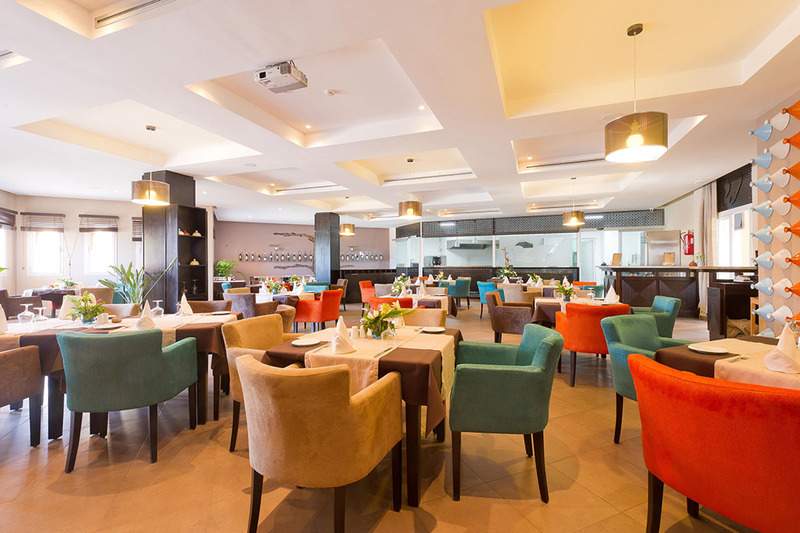 The food here is a delicious mix of Mediterranean dining, modern Moroccan dishes and traditional cuisine. For something more simple, Chiringuito surf house bar serves up burgers and drinks by the ocean. Whether your passion is to surf, to yoga or to clear your head with some restorative relaxation by the pool, this resort offers the perfect destination to for year-round sunshine and paddling with that warm sand between your toes, while the rest of Europe shivers in the cold. 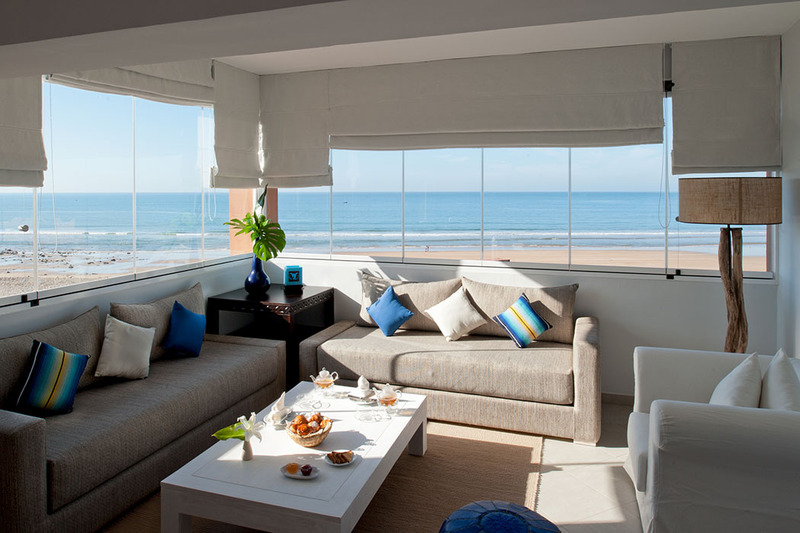 Nourish your soul at Martinhal Beach Resort & Hotel in the Algarve. 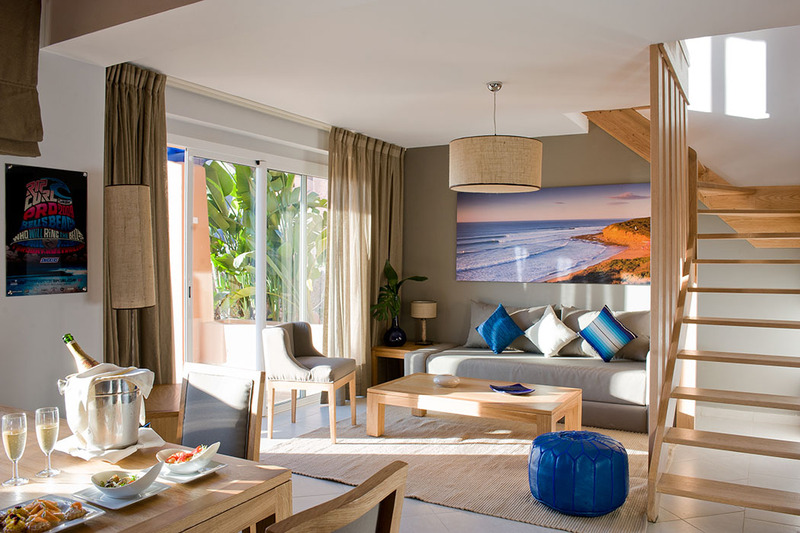 This beautiful five-star resort is located in the Algarve region of Portugal, at the south western most tip of Europe, only a one hour drive from Faro International Airport or two hours from Lisbon International airport. The hotel and has one of the best beaches in the area along with five swimming pools. Martinhal Bay is renowned for its offshore breeze and lessons will help you polish your surf technique or learn new skills. 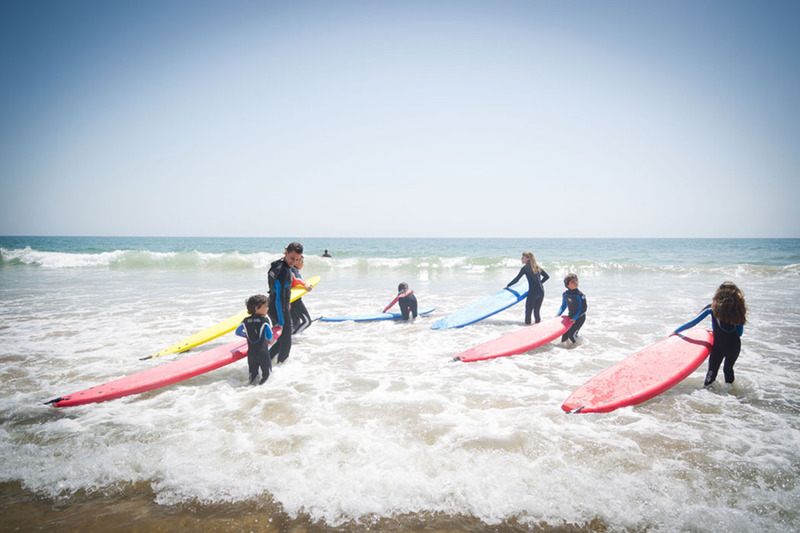 Windsurfing, skimming and kayaking, sailing and body boarding are also on offer. For drinks and chilling out after a day in the beautiful Portuguese sun, try the sophisticated Lounge Bar O Terraco or the surf-themed M Bar with live music. 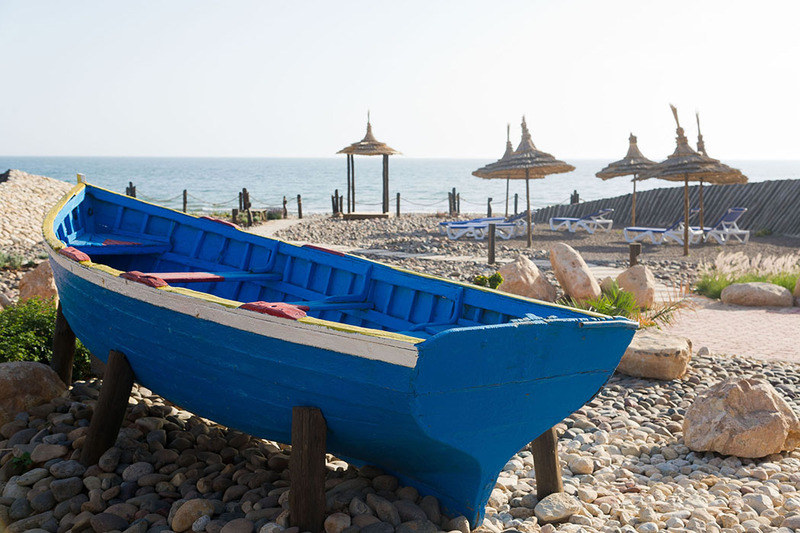 As well as being perfect for surfing, Martinhal boasts the perfect setting for its yoga weeks. Set on a great expanse of beach, there’s plenty of room for surfing, yoga, sunbathing and dipping your toes into the Atlantic Ocean. Closer to home, Wild & Free Adventures offer re-vitalise weekends at their Surf and Yoga retreat on the wild, North Coast of Cornwall. Here you can stay in the beautiful Yurt Village at The Park, Mawgan Porth, surrounded by lush greenery and just a short walk to the golden beaches. Sleep under the stars with a comfortable bed and rustic log burner. The Wild & Free team will prepare you 3 daily meals, all organically sourced, vegetarian dishes with fresh Cornish fish options and you dine either by the warm fire pit or inside the cosy cottage kitchen. In your free time, you can relax in the indoor heated pool or swim in the fresh air at the outdoor pool. Warm up in the sauna, steam room or enjoy a glass of wine in your private jacuzzi. Breathe in the fresh sea air and explore the many walks along the Cornish cliffs. Whatever you choose you will most definitely re-vitalise your body and soul. Back to the sunshine in Morocco, Surf Coast Morocco will tailor your yoga and/or surf holiday, to your exact needs and skills. They promise to find amazing waves for your level, along with warm water and sun all year-long At this very community-based experiences, you will share these experiences with other travellers who have a love of tasty food, an easy-going lifestyle and of course, stunning sunsets. 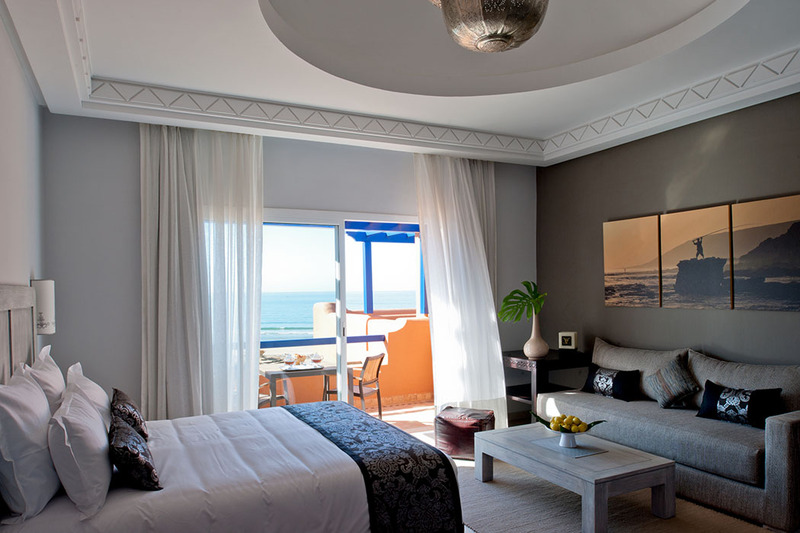 Accommodation is based in Tamrakht and Taghazout. Healthy and hearty food is important here so a delicious Moroccan and continental breakfast is served on the terrace along with sweet Moroccan mint tea. 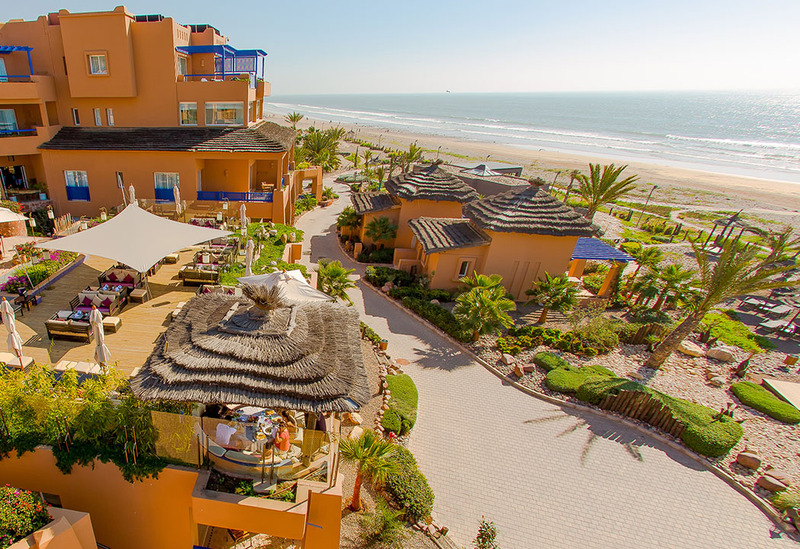 After a long day of yoga or surfing, a delicious dinner of international and Moroccan cuisine with hot tagines, fish or meat, veggies, fresh bread and salads will wait for you on the beautiful terraces. Qualified and encouraging instructors will help you to improve no matter your level. 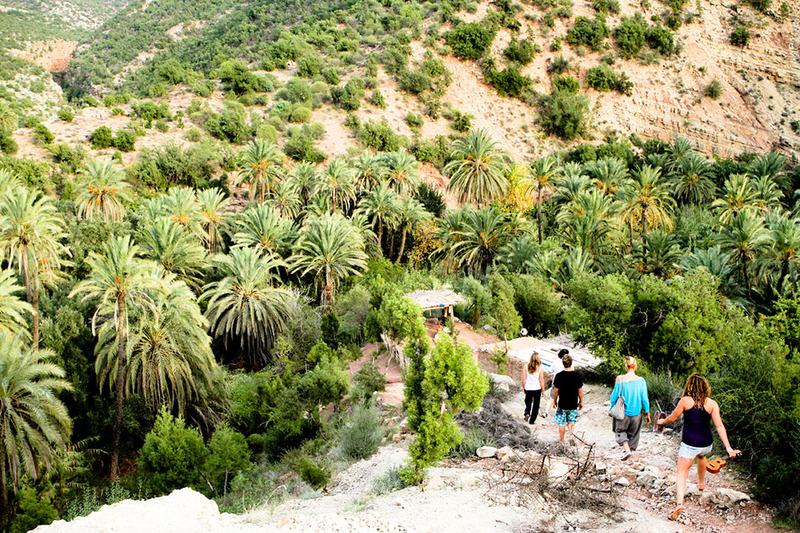 And if you need a day off, they will show you the real Morocco: vibrant souks, paradise valley, lively Marrakech or just watch the waves on a camel’s back. Karma Surf Retreat not only offers yoga with surfing, but they also offesr packages for climbing, mountain biking and stand-up paddleboarding as well. 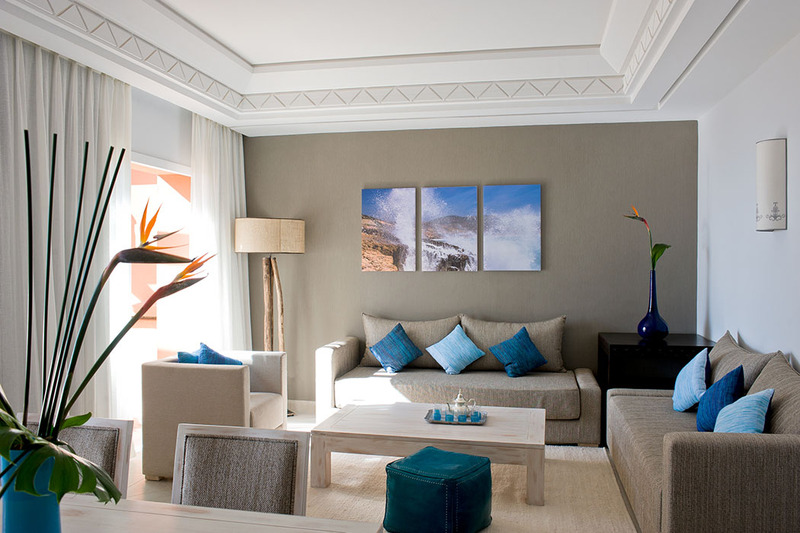 They run retreats at Algarve Villa in the Algarve or Guincho Villa near Lisbon. Begin your day with a morning yoga session by the pool or in the beautiful gardens with panoramic views across the ocean. Their yoga instructors, who also surf, know exactly which exercises will prepare you for the day ahead. 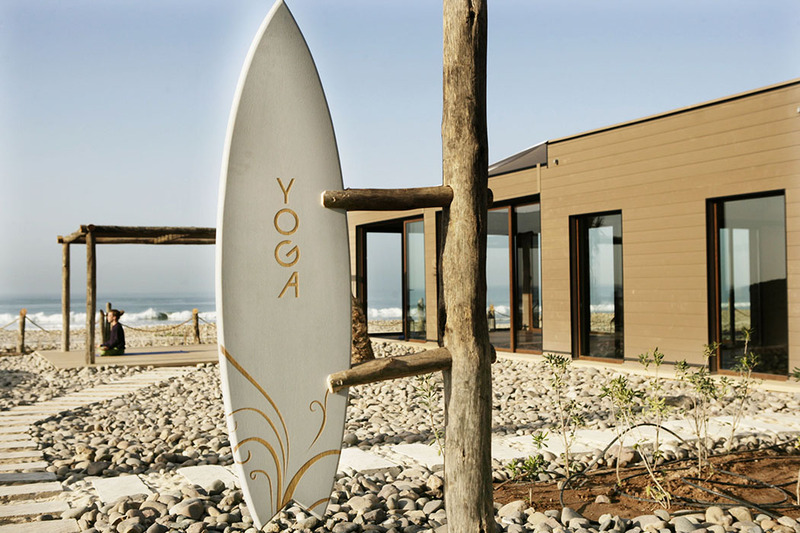 Stay at this retreat for the warm Portuguese sun, the pool & sea view, revitalizing yoga and an exciting surf experience. Karma Surf Retreats offer the perfect addon to a mini break in Lisbon and a great way to re-connect with nature and make some friends along the way.